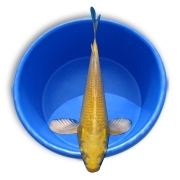 Live Butterfly Grade Koi drop shipped direct to you. - FREE SHIPPING! No pond is complete without the addition of live fish. Aquascape’s Stocking Packs provide you with hand-selected variety of fish. Simply place an order and quality Koi will be drop shipped direct to you. You will receive your Pond-Pack by Fed-Ex or UPS Overnight on either Wednesday or Friday. Each box arrives with instructions on how to acclimate the new fish. Please be sure that your water temperature is 60 degrees or above before ordering. All fish are guarenteed to arrive alive and in good health! (See more info below). Our fish are not exposed to any imported Koi that could carry diease so you can feel safe about adding our Koi to your ecosystem! Aquascape Koi are raised exactly as they were over 2,500 years ago in the original home of Koi Niigata, Japan. In fact, the mud and water chemistry at our farm where Aquascape Koi are raised, are closely matched to the ponds where Koi originated. Our fish farm's mud ponds are located at approximately the same latitude as Niigata, Japan so Aquascape Koi are suited to cold winter conditions which help guarantee a long healthy life. Available in the USA only - All Stocking-Packs include FREE SHIPPING! No, they are not flying fish. Butterfly Koi are Koi whose finnage is longer than the regular straight fin type Koi. Here at our Koi Farm we are working very hard to breed our Butterfly Koi with the finnage which has been determined to be the 'ideal' finnage by the AKCA.. Fish will be a hand pick selection of different colors and markings. Each Pond-Pack includes a live guarantee! NOTE: Orders must be received by 3 pm Friday for a Wednesday delivery & by the 3 pm Tuesday for Friday delivery. Any damaged fish claims must be received within 3 hours of receipt of delivery. All fish orders are non-returnable items! 1. Place the plastic bag, containing the fish, into a shaded part of the pond. As the bag floats on the surface, the water temperature in the bag will slowly adjust to the water temperature of the pond. This may take anywhere from 20-30 minutes. 2. After waiting, further acclimate the fish by opening the bag and slowly adding pond water. By mixing the pond water with the water in the bag, the fish will be allowed to adjust to the pH of your pond. 3. Let the bag float for another few minutes and repeat step 2 a couple more times. 4. Once you’re done, slowly remove the fish bag and free your fish into its new home. Dispose of the water in the bag away from your pond because it most likely has high levels of ammonia from the fish. 5. To help the fish aclamate to the new water, you can pre-treat with a Liquid EcoStarter available in our on-line store. Just click on the blue link to learn more or order.